We are a private foundation focused on developing and sharing knowledge about what works in early childhood development. We provide financial support and expertise to partners in government, civil society and business to help test and scale effective services for young children and families. Our mission is to improve opportunities for young children growing up in circumstances of social and economic disadvantage. We at the Bernard van Leer Foundation are committed to ensuring the privacy of all parties involved with our organisation. As our headquarters is located in the Netherlands, European legislation applies to our organisation. 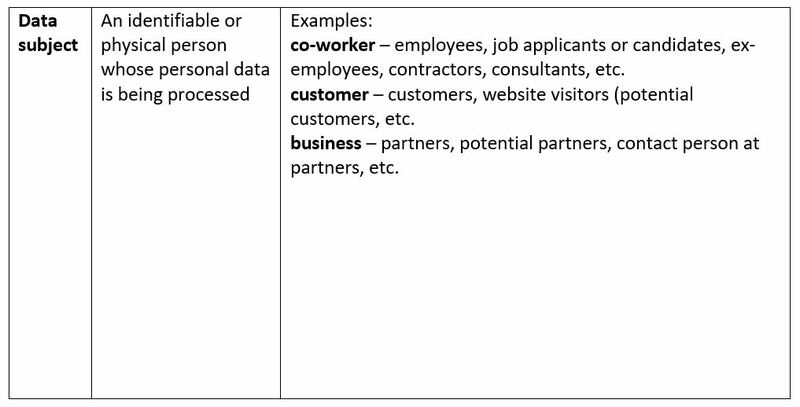 This privacy statement aims to give you an explanation of the General Data Protection Regulation (“GDPR”) and your rights as an individual (“data subject”) under this regulation. It also describes how we use and process personal data. For any questions, requests or complaints, please get in touch with our Data Protection Manager at DPM@bvleerf.nl. On the 25 May 2018, the EU General Data Protection Regulation (GDPR) came into force. The goal of this regulation is to protect the privacy of individuals with new standards regarding personal data processing. In short, this is about any kind of use of personal data about individuals. There are different parties involved in processing personal data. The GDPR distinguishes between a controller and a processor. The controller has final responsibility for everything that happens with the data, while the processor processes the data on behalf of the controller. There are also subprocessors that help process the data on the processor’s behalf. 4. Whose personal data do we collect? by means of cookies (that are placed when you opt in for our mailings and in any of our mailings). For more information on the cookies we use in this respect, please see below. 6. What legal grounds do we have to collect personal data? 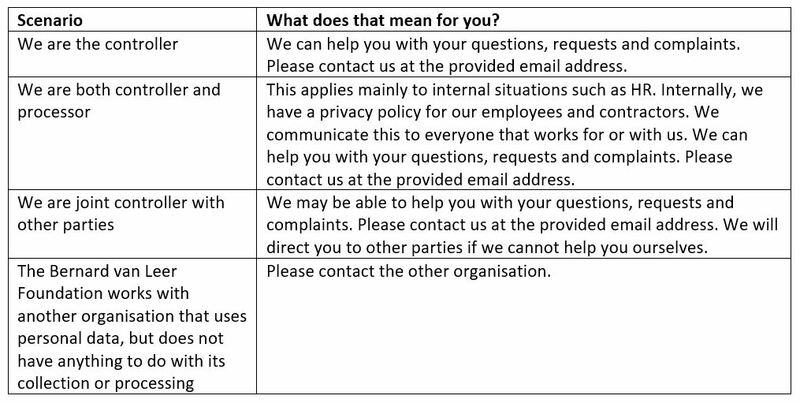 We have two legal bases for processing your personal data with respect to our mailings: your consent or our legitimate interest if you are our client. Our legitimate interest translates into our objective to communicate relevant legal and tax developments and to invite our valued clients and contacts (and their partners) to events. We aim to send only relevant mailings, to personalise our mailings, and to keep our database up to date. Furthermore, we use the information provided by you to better understand the recipients of our mailings and to improve our mailings and service offering. 7. What types of information do we collect? When you visit or contact us through the website, you may provide us with information about yourself, such as your email address or postal address for receipt of our publications. For our grantees we collect information relevant for the execution of the grant. We are required to process some of the personal data in order to be able to send you the mailings. Of course, you may refuse to give us certain personal data. Please keep in mind that this may result in us being unable to send you the mailings or to correctly address you in these mailings. In the context of the purposes listed above, we may share your personal data with third parties, such as Salesforce and/or Campaign Monitor, Microsoft 365. Data processing agreements are in place with these third parties. We hold your personal information on our systems for only as long as is necessary for the purposes outlined above. We remove personal data from our systems once it is no longer required, in line with our guidelines on how long important information must remain accessible for future use or reference, as well as when and how data can be destroyed when it is no longer needed. The length of time each category of data will be retained will vary depending on how long we need to process it for, the reason it was collected and any statutory requirements. After this time the data will either be deleted or we may retain a secure anonymised record for research and analytical purposes. We will store your personal data until the moment you have informed us that you no longer wish to receive our mailings, we cease the sending of the relevant mailings, or it appears that your email address is no longer in use (for example when we receive a failed delivery notification). Information relating to one-time events will be deleted when the particular event has taken place and we no longer need that information. To exercise your rights, please contact our Data Protection Manager, via DPM@bvleerf.nl. Finally, you have the right to lodge a complaint with the relevant Data Protection Authority, such as the Dutch Data Protection Authority. 12. How can you change the settings of/delete cookies?